When sightseeing in Denmark, the Christiansborg Palace is a gem for lovers of architecture and history. A winter snowfall adds to its romantic fairytale appearance. This major attraction's appeal is further enhanced by the presence of ruins dating as far back as 1167 AD, when it existed as Absalon's Castle. The complex consists of several different buildings, centred round a Neo-Baroque core and is home to important institutions: the Danish Parliament, the Prime Minister's Office, and the Supreme Court. The royal family uses the palace church, the Royal Reception Rooms, and the Riding Ground Complex. From the front steps of the main castle there are also some stunning churches within easy viewing distance. This attraction embodies the essence of Danish history, architecture, and royalty. 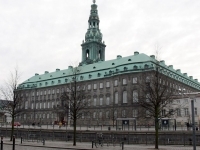 It is best to do a guided tour of Christiansborg Palace as, although the state rooms and everything else are very impressive, there is not much information available. A guide will enrich the visit by explaining the historical, cultural, and political significance of what visitors are seeing. Tours are usually conducted twice a day and there is no extra charge. Opening times: Most of the palace is open daily between 10am to 5pm; between October and April it is closed on Mondays. It is always possible that the palace might be closed for special events. Admission: Royal Reception Rooms, adults DKK 90 and children DKK 45; the Ruins, adults DKK 50 and children DKK 25; combined ticket for several attractions, adults DKK 150 and children DKK 75.